Members of the Society of Yorkshire Magicians hold a special concert and competition at the Textile Hall, Bradford, on Wednesday. Mr. W. C. Joans, of Leeds, vice president of the society, gave a massive gold medal for the most original entertainment submitted by any member. 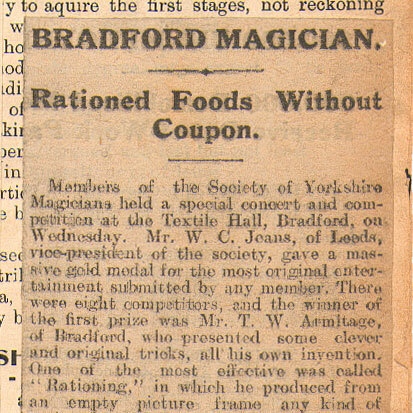 There were eight competitors, and the winner of the first prize was Mr. T. W. Armatage, of Bradford, who presented some clever and original tricks, all his own invention. One of the most effective was called “ Rationing” in which he produced from an empty picture frame any kind of rationed article and no coupons required. He also turned water into milk, and baked a number of cakes before the eyes of the audience and without oven or fire, and yet the cakes came out piping hot. The company were impressed by the degree of originality shown by Mr. Armatage. Mr Alfred Brown, of Leeds, was awarded the second prize.